How to hire a gondolier in Venice, plus a money-saving alternative to gondolas on the Grand Canal. If the price bothers you, don't do it. If the price doesn't bother you, make sure you understood the gondolier correctly. Fact is, a gondola cruise in Venice is like traveling by hansom cab in New York's Central Park: It can be a delightful experience, but only if you're able to forget the price and focus on the ride. ABOVE: A gondola carries up to six passengers. INSET BELOW: A gondolier in a traditional straw hat, happy gondola passengers, and a squero where gondolas are built and repaired. The city of Venice sets official rates for gondola rides, which started at €80 for 40 minutes the last time we checked. Additional 20-minute increments are €40. After 7 p.m., the base rate climbs to €100, with €50 for an additional 20 minutes. Up to six people can share a gondola. This doesn't mean you'll actually pay 80 euros, or that you'll get a 40-minute ride. Depending on demand, gondoliers may regard the official rates as a polite fiction. Special services, such as singing, can boost the fare even more. This means you should negotiate both the rate and the length of the ride before you get into the boat. 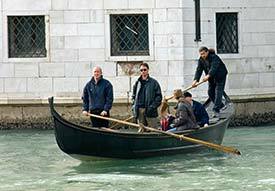 Otherwise, your gondola ride may be memorable for reasons that have nothing to do with sightseeing. If you dislike negotiating, you can leave that chore to your hotel concierge, though he (or she) may add a hefty surcharge. A few years ago, a reader told us that he'd paid the Hotel Bauer's concierge €120 for a gondola ride just before Carnevale, but he added that he didn't mind the rate and got great service. Another reader (presumably well-heeled) spent a mind-boggling €150 for a 50-minute ride and thought the expenditure was "well worth it." To be fair to Venice's gondoliers, they invest a great deal in their boats: about €20,000 for a traditional hand-built wooden gondola with a useful life of about 20 years. They need to earn the bulk of their annual income in a few short months. Finally, a gondolier's living costs may be higher than yours, since Venice is an expensive city in one of Italy's wealthiest provinces. Look it at this way: The man who's rowing you up the Grand Canal probably could earn more money for less work at an industrial plant on the mainland. ABOVE: Two gondolas pass a vaporetto on the Grand Canal. INSET BELOW: Parked gondolas with oars tucked away, and a gondola flotilla in a side canal. You'll find gondolas and gondoliers throughout the main tourist areas, from Tronchetto and the Piazzale Roma (where motorists park their cars) to the Rialto Bridge area, the Doge's Palace, and busy pedestrian crossings along the secondary canals. Chances are, you'll encounter men who politely ask "Gondola?" as you walk past the flotillas of parked boats. If you'd rather not haggle with gondoliers, or if you prefer music with your ride, consider booking a tour through a travel agency. 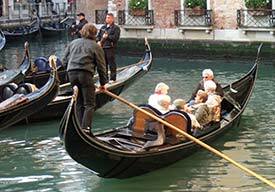 Viator offers online reservations for the Gondola Serenade Tour and other excursions; you can book ahead and lock in the price by prepaying in your own currency. ABOVE: A traghetto crosses the Grand Canal. INSET BELOW: A fisheye view from inside a gondola ferry. Venice's best transportation value is the traghetto, a public gondola ferry. Traghetti are similar to privately rented gondolas, but you'll pay only €2 to cross the Grand Canal at one of the half-dozen ferry points between the railroad station and the Campo del Traghetto near St. Mark's Square. The ride is short, and service can be sporadic these days, but the experience is memorable--especially if you emulate the Venetians by standing up during the crossing. For more information and photos, see our Traghetto article. Learn about the gondola's history, or assemble a bibliography of books (mostly in Italian) about gondolas and Venice. 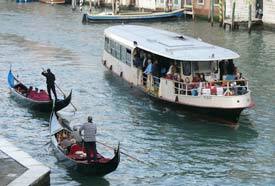 The site also discusses the traghetti or gondola ferries across the Grand Canal. Use the numbers on the City of Venice's gondola page as a starting point for negotiating with gondoliers. If you're lucky or it's out of season, the gondolier may be happy to take you for the official rate. This article from VeniceWord, a media service in Venice, describes the history of the gondola and current construction rules. Are you pressed for time (but not for money) and stressed by a tight vacation schedule? Get a soothing spa treatment and see the sights in one two-hour session. Top inset photo copyright © Elizabeth Korenbaum.